Posted by kind permission of the Irish Examiner. Author Niall Murray. Some time soon after the Rising, Nora Costigan wrote home to her brother Bob in Tipperary town. The siblings had grown up in a small cottage in Barnora, near Cahir. But in 1916, 26-year-old Nora was a teacher at a national school that had only opened the year before in the small village of Clogh, near Castlecomer, Co Kilkenny. She had trained at Carysfort College in Blackrock a few years earlier, meaning she knew Éamon de Valera who had lectured there. She even refers to him kindly at the end of her letter. 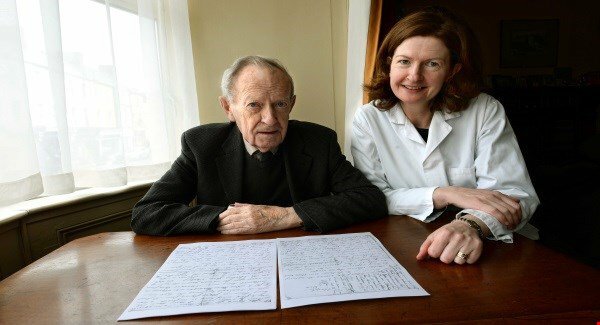 The four-page letter has been kindly shared with us by Bob's son — also Bob, a retired pharmacist living in Tipperary town — and his family. 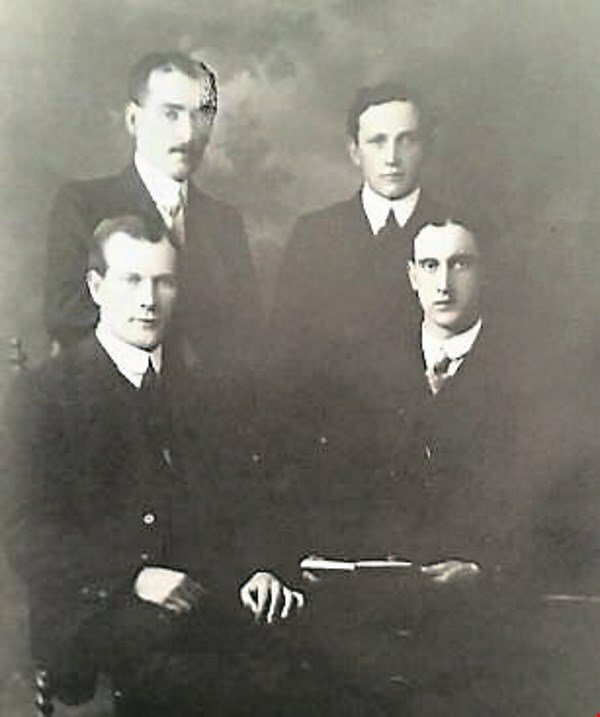 Bob Costigan (front left) with brothers Mick, Andrew and Pat. Nora described to Bob how she happened to be in Dublin on Easter Monday, 1916, just as the fighting broke out. 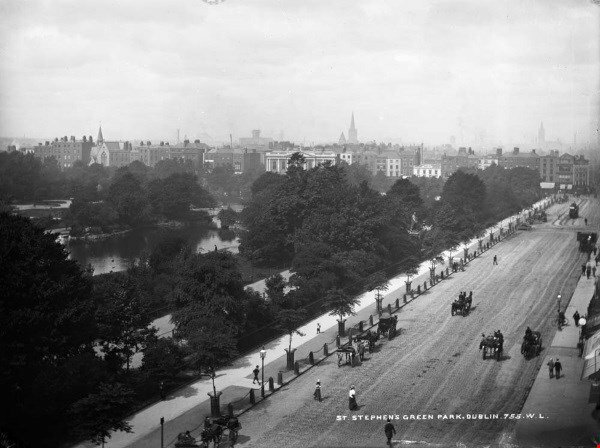 What transpired over the next week, as she relates in detail to her brother — a shop assistant at home in Tipperary — reads like any of the accounts in modern media by those caught up in recent terror attacks. 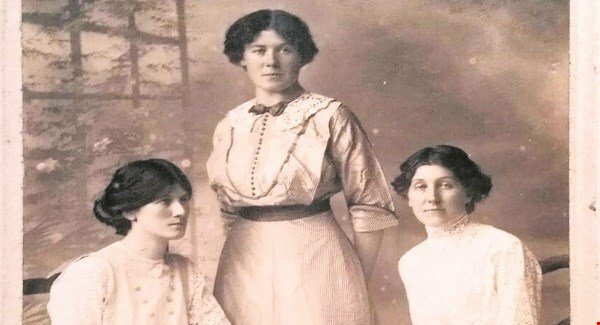 Being at the mercy of fate more than anything else, Nora Costigan seems to have gone between the frying pan and the fire several times in this week 100 years ago, beginning on Easter Monday, April 24, 1916. 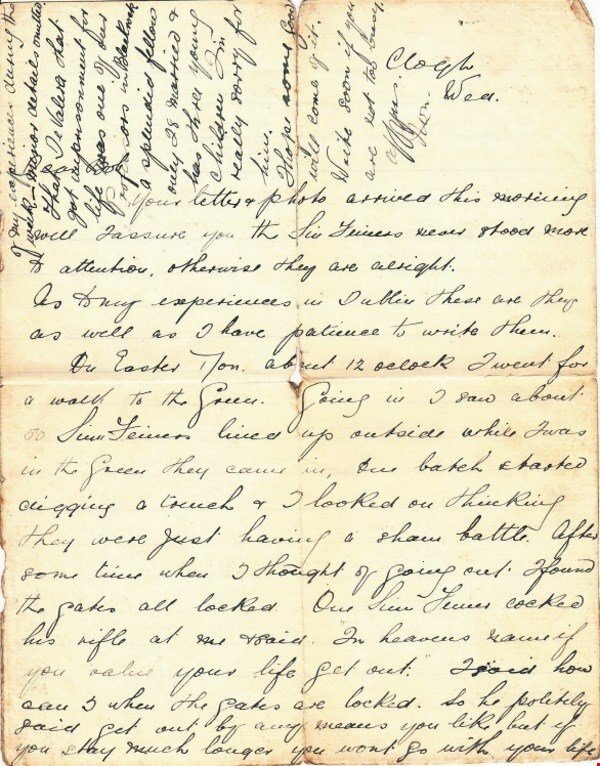 Nora Costigan's letter to her brother Bob, recounting her survival of the Easter Rising. Picture courtesy of Costigan family. Your letter & photo arrived this morning. Well I assure you the Sinn Feiners never stood more to attention, otherwise they are alright. As to my experiences in Dublin these are they as well as I have patience to write them. On Easter Mon. about 12 o'clock I went for a walk to the Green. Going in I saw about 50 Sinn Feiners lined up outside. While I was in the Green they came in, one batch started digging a trench & I looked on, thinking they were just having a sham battle. After some time when I thought of going out, I found the gates all locked. I said how can I when the gates are locked. So he politely said get out by any means you like but if you stay much longer you won't go with your life. So after trying for some time I managed to get out by a side gate. I came down the city to find everything in confusion. A tram being blown up, glass flying from the post office. So I managed by going the back streets to get to where Miss Madigan was staying in Marlboro St.; but of course I couldn't have gone to a worse spot for we were just in the centre of all the shooting, fires & looting. We had a splendid view of the Sinn Feiners in the Post Office & saw them hoist the Republic Flag when they took possession of it. Nothing used terrify me more than to see these poor fellows moving stealthily on top of the Post Office, knowing what their end must be. A few military came out on Mon. but instantly the officer was shot (I saw him fall.) then both military & police were called in & we were left to the mercy of the looters till Wed. morning. I had a splendid opportunity of viewing the Sinn Feiners for this street was the main thoroughfare for reinforcements to the P. Office. On Wed. morning the people were driven out of bed by a volley of cannon. Then real terror struck us for the houses were shaking. The military had entered the city & war had begun in earnest. By 12 o'clock there were about 15 people shot in this street, some dead, those that were not dead died in the street later from wounds. Of course nobody dared go near them. They were lying dead in the street till the following Sun. morning. On Wed. morning the fire took possession of Clearys [sic] & of course their back premises come right up against the house I was staying in. 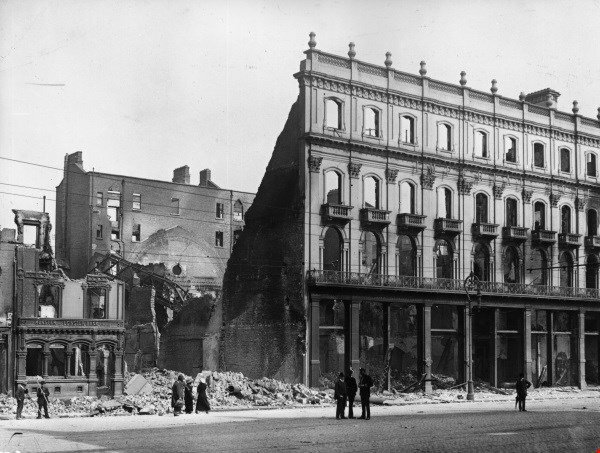 Nora Costigan and others were stranded at the outbreak of the Rising, in Marlborough Street, to the back of Clery's hotel whose ruins after the rebellion are shown here. Picture: Topical Press Agency/Getty Images. Now was the horror — there were shots raging to the front & flames that seemed to light the heavens as well as the earth coming in at the back. You could not fancy the horror of the position unless you were actually in it. At night fall we prepared to fly from the house. We stood in the hall all night ready to make a rush (where, we didn't know) if there was any lull in the firing, but no. About 6 in the morning we were desperate and rushed into the street. After seeking shelter in two houses & finding them full, some men broke in the door of the Masterpiece Theatre & in there we went. About 12 that day the military rushed in with bayonets fixed, but when they ascertained that we were not a hostile crowd they took possession of the place & remained on guard. Now we were just the cockpit for all the firing, for the Sinn Feiners on the roofs had the theatre surrounded & fired on it from every direction, knowing the military were there. On Friday we gave up all hopes, for the military in some other part of the city started shelling the theatre, thinking it was Sinn Feiners were there. Luckily they discovered the mistake before it was too late. As it was, some of the people were verging on lunacy. 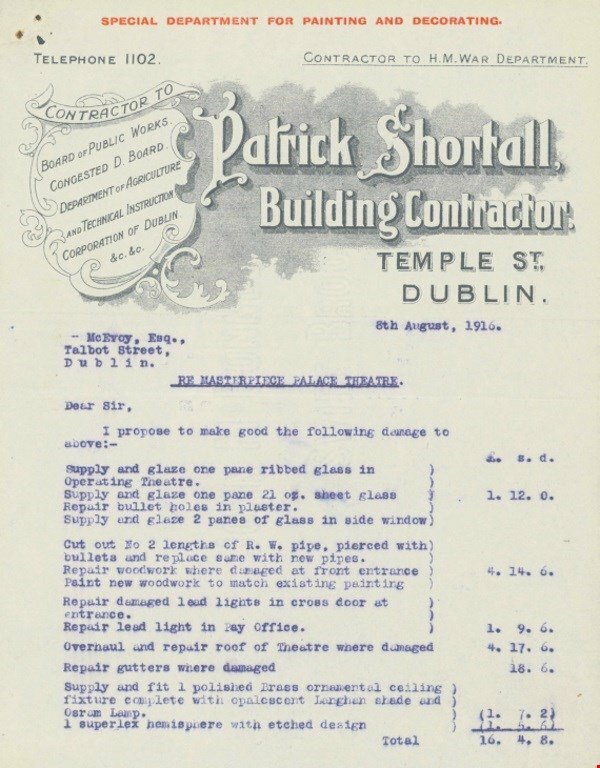 A compensation claim for damage to the Masterpiece Theatre - where Nora Costigan and others took shelter, along with the British military - included this estimate for £16, 4 shillings and 8 pence for repairs to bullet damaged pipes and plaster. Picture: National Archives of Irleand. On Sat. the officer came with orders that we had better be removed to the Custom House as they were fearing a rush of the Sinn Feiners on the theatre & in that case it would mean a hand to hand fight with bayonets & no Christian would escape alive for the place was in total darkness. With sinking hearts we prepared to go but the firing on the streets was so bad that the officer said we might as well die inside as on the streets. So we remained and resigned ourselves to the inevitable. About 5 o'clock the good news arrived that the Sinn Feiners were surrendering. However, we were not allowed out till about 1 o'clock that night. During all the time we were shut up we never had a morsel of food & of course sleep was a thing unknown. On Sun. morning I got a pass from an officer to go up to the Nurses Home. So I remained at Berkley House that week. I came here on the Friday of that week & had to get a “permit” from Dublin Castle to leave the city. This as well as I can remember is the account of my experiences during the week — minor details omitted. That de Valera that got imprisonment for life was one of our Professors in Blackrock, a splendid fellow only 28, married & has three young children. I'm really sorry for him. I hope some good will come of it. Write soon if you are not too busy.